More than the proximity, it’s a distinct respect for Japanese culture that binds the Russian far eastern island with its neighbour to the south. Cities in the southern part of the island of Sakhalin are defined by what locals call a distinctly Japanese characteristic: compactness. Unlike largely European cities on the Russian mainland with their broad avenues and now tastefully restored pre-Civil War architecture, Sakhalin’s towns combine Soviet planning with Japanese size. The broad layout of Yuzhno-Sakhalinsk, the region’s administrative centre, shares similarities with small provincial towns in a Japanese prefecture. The city rapidly moved on from its days as Toyohara, the name bestowed by the Japanese rulers, but has managed to maintain certain relics from its days as the northernmost provincial city in Japan. 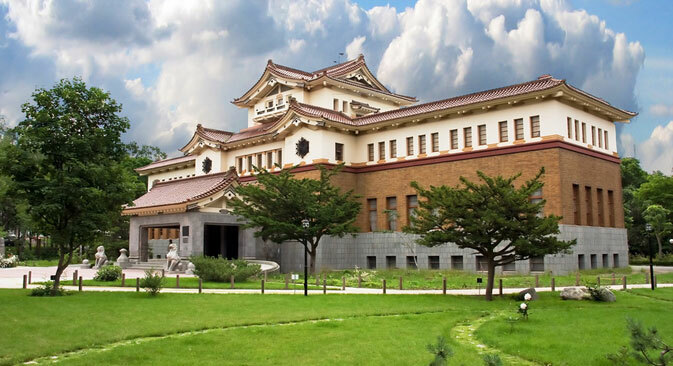 The biggest symbol of the Japan’s one-time presence on the island is the Sakhalin Regional museum, a building, which at first glance reminds one of a Japanese palace. The building, which was used as the administrative headquarters of the southern part of the island then known as Karafuto, is a rare and fine example of Russo-Japanese fusion architecture. Visitors to the city from the ‘Land of the Rising Sun’ often comment on how there is probably no similar structure back home, but for Sakhaliners, it is a piece of Japan on the island. Yuzhno-Sakhalinsk also has a small Japanese Buddhist pagoda and a few smaller monuments in different parts of the city. A great way to see some of the older Japanese monuments on the island is by bicycle on the disused Kholmsk-Yuzhno-Sakhalinsk railway line. There are a series of Japanese-built tunnels and the scenery starting from the port of Kholmsk right through the interiors of the southern part of Sakhalin can be absolutely breath-taking at times. More than the proximity, it’s a distinct respect for Japanese culture that binds Sakhalin with its neighbour to the south. Many long-terms residents of the Russian island grew up listening to music from Japanese radio stations. It was next to impossible for the authorities to block these signals and many a time Western music made its way to homes in Sakhalin via Japan. Once the Soviet-era border zone restrictions were lifted from the island in the early-1990s, the Japanese were the first tourists to visit the island. This led to a renewed interest in Japanese culture and the language with cultural programmes, including film festivals being well-received on the island. Accepting the loss of the southern half of Sakhalin as fait accompli, Japan opened a consulate in Yuzhno-Sakhalinsk to promote trade and cultural exchanges between the countries. Sakhalin’s state university and the largest private university both offer a philology programme where Japanese can be taken as a second language. This option remains popular among students who see potential opportunities in Japan or with any of the Japanese companies involved in the oil and gas projects in Sakhalin. Relatively easy visa procedures and a ferry service connecting the town of Korsakov on southern Sakhalin with Wakkanai on Hokkaido have also made travel to Japan easier and less expensive. The traffic is two-way and fascinated Japanese tourists take the ferry north to see a part of Russia that is far closer to Tokyo and Osaka than it is to the great Russian cities of Moscow and St Petersburg. Sakhalin is also a trend-setter when it comes to Japanese cuisine. Almost a decade before sushi bars became vogue in Moscow, the Russian far eastern island had a good collection of Japanese restaurants. The combination of easily available sea food and adventurous entrepreneurs from the other side of the La Perouse Strait gave the island a vibrant Japanese gastronomic scene. It’s impossible to live in the administrative capital of Sakhalin and not know about its most famous Japanese entrepreneur. Yutaka Miyanishi, now in his late-70s, came to Sakhalin around the time the island was thrown open for visitors to the outside world in the early-1990s. He has since opened the most frequented Japanese restaurant on the island: Furusato (which means homeland in Japanese). Since moving to Sakhalin, Miyanishi-san, as he’s affectionately called by Sakhaliners, has been dedicating a great amount of time in bringing Russia and Japan closer together. Besides his involvement in the Rotary Club and occasional compositions for the island’s chamber orchestra, the Japanese entrepreneur sets aside time for social causes. Support for children’s homes and sponsorship of sports teams have endeared him even more to the Sakhalin public. Those who are lucky enough to be in Yuzhno-Sakhalinsk when the cherry trees start to blossom (and this event was delayed by a painfully long winter in 2013) need to walk in the Miyanishi alley in the city’s Gagarin Park. Miyanishi-san specially arranged for the ‘sakura’ saplings to be imported from Japan and planted in one alley of the park for Sakhaliners to get a feel of spring in Japan. With Sakhalin set to be used as a major transport hub to connect Russia with East and Southeast Asia, the links between the island and Japan are set to grow.